It's time again for the Caltrans District 7 Bicycle Advisory Committee and Enci and I are busy preparing the Cyclists' Bill of Rights, along with a small diatribe on Transportation as a Civil Right, all for presentation tomorrow. 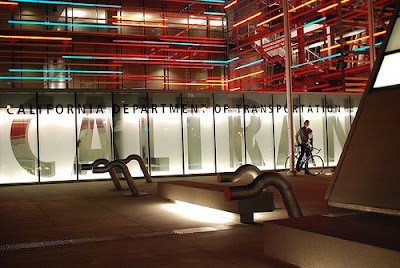 We have been participating with the Caltrans BAC since its inception a couple of years ago. 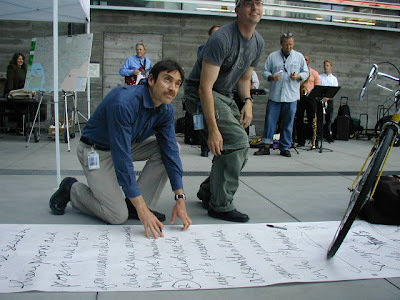 We were at first a little surprised when we received an invitation from Dale Benson to join the nascent BAC because we thought of Caltrans as the department which poured cement, lots of cement, all in an effort to move motor vehicles, lots of them and as fast as possible. Enci and I gave it a shot and rode the 101 north on our way to Santa Barbara and found it to be an exhilarating experience that came with equal parts terror and joy. 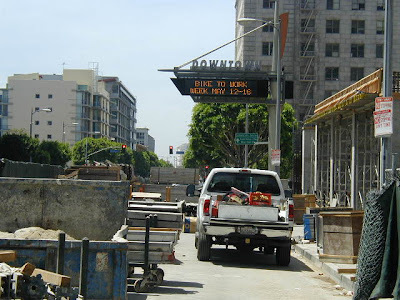 As for the Caltrans commitment to alternative modes of transportation, its Deputy Directive 64 is a version of "routine accommodations" that is designed to "Ensure that best practices for non-motorized travel are included in all district projects and project planning. Ensure that best practices for non-motorized travel are implemented in maintenance and travel operations practices." All of which is to say our experience with Caltrans has been positive and that they are involved in funding local projects, laying down local standards and setting policy for our community, all driven by a commitment to support pedestrians and cyclists. Before you get all misty eyed, keep in mind that the BAC meets in a building that celebrates the Caltrans relationship to the motor vehicle with Motordom, the largest public art installation in the City of Los Angeles. At four stories tall, Motordom (Keith Sonnier '04) uses neon and argon to dramatically recreate the lights found on the freeway at night. As you can see in Al's photo, it all looks even better positioned appropriately behind a cyclist. Now that's beautiful! 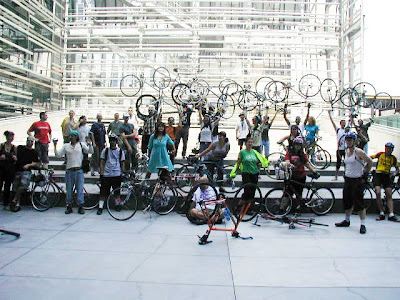 This past Thursday, on Bike Instead of Work Day, about 50 cyclists dropped by the 100 Main Street Plaza to visit Dale Benson and Keith Sellars, two of our cycling buddies and the Caltrans hosts for Bike to Work Day. 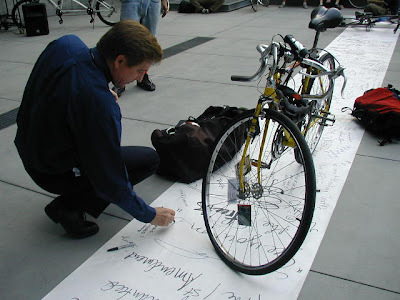 We unrolled the Cyclists' Bill of Rights and we were able to pick up a few endorsement on the ride. Dale Benson and Keith Sellers were our gracious hosts. Jim Hammer, Deputy District Director, State of California Department of Transportation endorses. Hollywood & Western, Sunset Blvd, City Hall and now the Caltrans Plaza...the crew finally fragmented into those who had to work, those who swore allegiance to Phillipe's and those who headed off to USC for the Bicycle Movement element of the Los Angeles Neighborhood Initiative Forum, presented by our friends Erik Knutzen and Lynne Goldsmith. And this is our reality! No, really, ride anywhere! It's Bike Life!